The Alta Vista Hotel in Colorado Springs is notable because it is where Nikola Tesla stayed while he worked in Colorado Springs. Though it no longer stands, there are photographs and a smattering of information about it. For today’s Writing Project Wednesday, I’m going to give you the history of Tesla’s home away from home in Colorado! -The Alta Vista Hotel was built around 1889, just a few blocks from the train station. It was torn down in 1962. You can see pictures of it during the demolition on The Colorado Springs Gazette here. -It was located at 112 N. Cascade Avenue. The Kirkpatrick Bank and its parking lot sit on that site now. You can see the spot where it stood in my pictures from my trip to Colorado Springs here. -The Alta Vista Hotel was made of stone and brick. You can see a beautiful colorization of it here. Additional photos of it can be found on The Tesla Universe site here and The Pikes Peak Radio and Electronics Museum site here. -Tesla stayed in room 207 or 222, depending upon whom you ask. Most of his biographers agree that it was 207. As the story goes, he selected his room because the number was divisible by 3, a prime number. -Tesla also famously asked for eighteen fresh towels to be delivered to his room every day. The biographies about Tesla abound with these details as if every biographer seems keen to prove Tesla’s eccentricity. 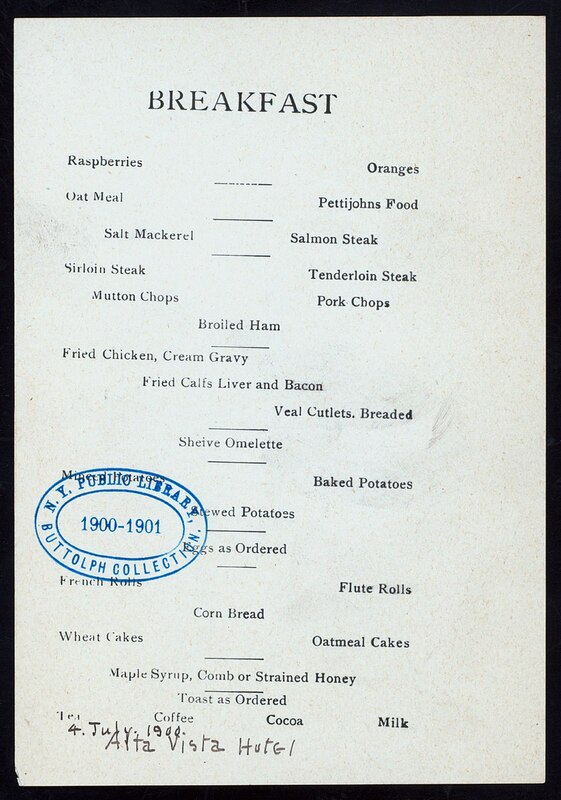 -In researching more facts for this article, I stumbled across a copy of the breakfast menu at the Alta Vista Hotel that is in the New York Public Library’s digital collection. I have to say, some of my most fascinating research is seeing what people used to eat. -I also found a sample of the letterhead from the Alta Vista Hotel on the Tesla Universe site. 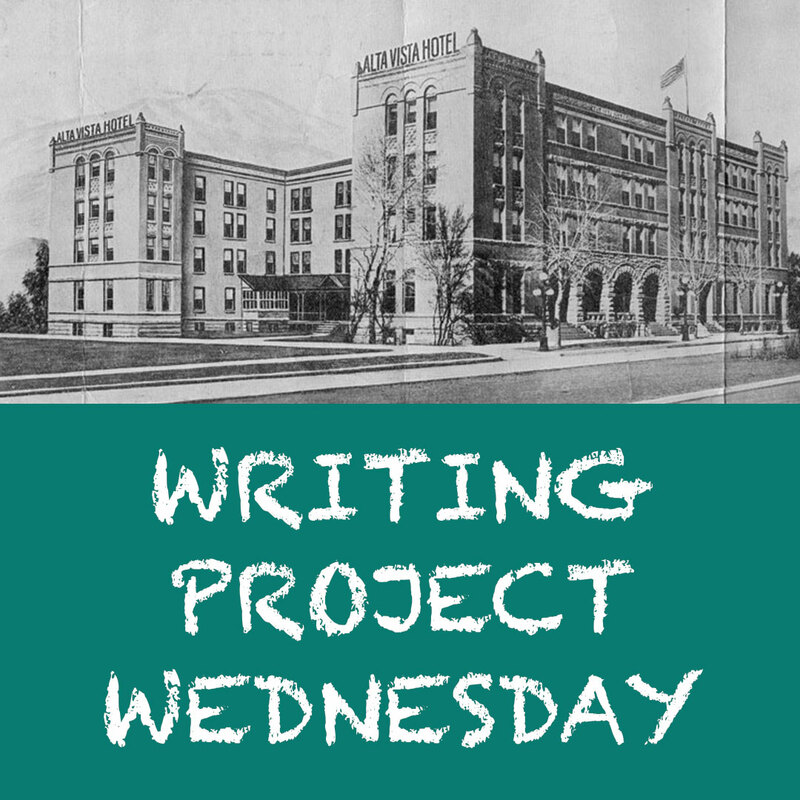 On the next Writing Project Wednesday, I’ll be talking about trains!